[Yesterday] Parks & Recreation Commissioner Adrian Benepe released a red-tailed hawk who was rescued and rehabilitated over the summer. The six-month-old bird of prey's nest fell off an air-conditioning unit (seriously, those things are dangerous if magical) and some bird lovers scooped him up and took him to a licensed falconer. The male hawk's return to the wild witnessed by Urban Park Rangers, Bobby Horvath of Wildlife in Need of Rescue and Rehabilitation (who helped care for the hawk) and first and second graders from P.S. 83 and the Dalton School. 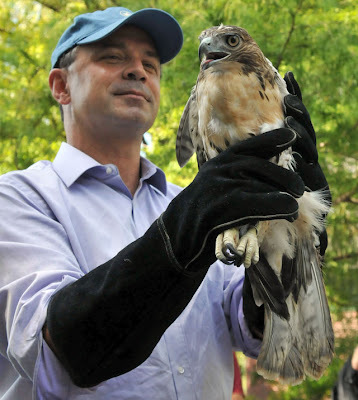 Apparently, Mr. Benepe "forgot" to invite the folks who actually helped rescue the hawk - not to mention thank those who created the opportunity for him to try to get some positive publicity. The collaborative effort included three South Bronx residents - Lee Rivera, Danny Chervoni and Friends of Brook Park president Harry Bubbins, two Brook Park volunteers, Geoffrey Croft of NYC Park Advocates and lots of good-old-fashioned South Bronx goodwill along the way. 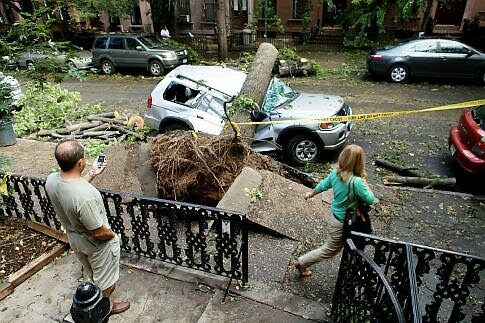 But this is what we can expect from a guy who slaps his name on the side of tree removal contractors' trucks. NEW YORK (CBS 2) — Get ready for your clothing budget to take a hit. Starting this Friday, afforable clothes in New York will become more expensive. The state’s sales tax exemption for clothing and footwear costing less than $110 will expire. That means a 4-percent price increase starting on October 1. The tax was reinstated to help close the state’s budget deficit. The exemption returns next April, but only for purchases less than $55. Hey, how's that Claire Shulman investigation going? Oh, wait, Bloomberg endorsed you. Never mind. 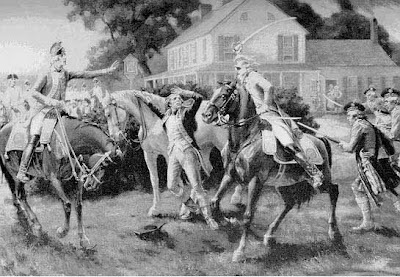 Exactly 234 years ago this month, a Revolutionary War general died from wounds incurred during a defiant showdown with the British - a gripping tale of patriotism that began in Queens. A few weeks ago, Daily News reader Lavington Charles suggested the spot where Woodhull was fatally injured - at 196th St. and Jamaica Ave. in Hollis - as part of the Queens Heritage Quest series. Tradition describes a dramatic scene during which Woodhull encountered British forces and soon surrendered his sword. An officer then ordered Woodhull to proclaim, "God save the king." "God save us all!" Woodhull responded. The officer, sometimes identified as Capt. James Baird, slashed Woodhull with a saber - delivering multiple blows that led to his death in captivity about a month later on Sept. 20. Sabine cited a dusty scrapbook with Woodhull's own account of the capture - apparently given to a lieutenant who was with him in a prison camp when he died. Woodhull supposedly said that he surrendered his sword to - and was then struck by - an American Tory, loyal to the British, named Capt. Oliver DeLancey. Regardless of the circumstances, historians insist that Woodhull's death helped define a crucial period around the time of the famous Battle of Long Island. His agonizing demise - and the apparent refusal by the British to allow medical care - reminded colonists of the brutality of their rivals. WHEN QUEENS was battered by severe storms and two twisters 10 days ago, neighbors banded together to help each other until the emergency crews showed up. But what happens if your neighborhood covers more than 200 acres and is populated by the dearly departed? 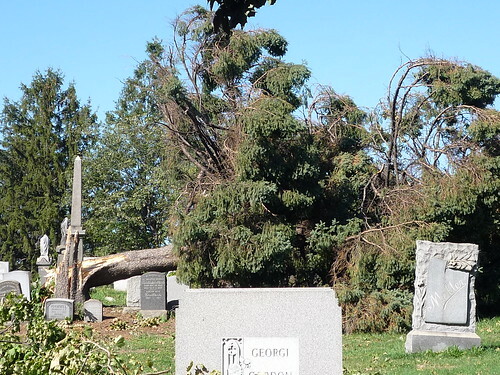 Several cemeteries in Queens faced that problem last week as they struggled to recover. City cleanup workers won't venture onto these properties unless the damage was done by a street tree. Things were in such disarray at Mount Hebron and Cedar Grove cemeteries in Flushing that workers discovered a highway sign from the Van Wyck Expressway and a portable toilet. "I'm not sure where it came from," Jerry Hass, president of the Cedar Grove Cemetery Association, said about the portable toilet. "We're just lucky that it happened at 6p.m. and not 2 p.m. Anyone out on the grounds at that time would have been killed." Hass said he was heartened to receive calls from administrators of other cemeteries offering help. It's unclear whether cemeteries such as All Faiths, which is nonprofit, will be eligible for disaster aid. In a sign of the toll the dismal economy has taken on working families in New York, more than 1 in 10 households living in public housing owe at least one month in back rent, a rise of nearly 50 percent over the past year. Though the city has always had to deal with a number of public housing tenants who are chronically late with their rent, housing officials are now confronting a significant rise in longtime tenants who never before missed a payment but are falling behind, in many cases because they have lost their jobs. Across the city, tenants of nearly 22,000 public housing apartments, or about 12 percent of the total, owed back rent as of Aug. 31, according to the New York City Housing Authority, which runs the largest public housing system in the United States. The comparable figure in August 2009 was about 15,200. The problem is the worst in Queens, where the number of households owing back rent increased nearly 70 percent between August 2009 and last month, to 2,424 from 1,431. In six of the public housing developments in the western part of the borough, more tenants missed payments than anyplace else in the city, according to Housing Authority statistics. At the Astoria Houses, for example, the number more than doubled, to 157 households from 64; the latest number is 14 percent of the development’s 1,103 apartments. 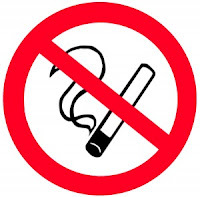 A city councilman wants a filtered version of Mayor Bloomberg's plan to curb smoking at parks, pedestrian plazas and beaches. Peter Vallone (D-Queens) believes the mayor's proposed ban -- which has the endorsement of Council Speaker Christine Quinn -- is going too far, and he plans to introduce legislation to lighten it up. Vallone, a self-described "health nut" who supported the mayor's 2002 smoking ban in restaurants and bars, wants to nix the suggested restriction on puffing on pedestrian plazas. He also wants to create smoking zones in parks and on beaches larger than two acres. He supports the concept of curtailing smoking on beaches and in parks because "too many smokers seem to believe they have a right to flick their cigarette butts wherever they happen to be." Bloomberg, through a spokesman, declined comment on the proposed legislation. 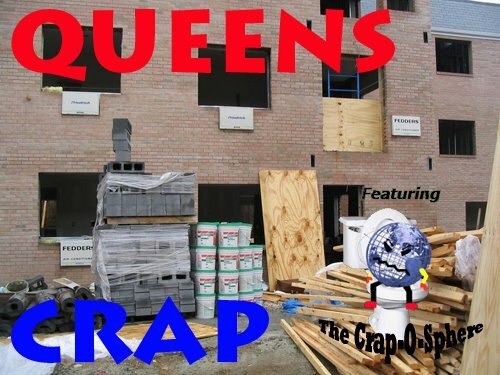 Queens Crap was featured in a news report! NEW YORK (WPIX) — People in Queens are giving credit to PIX 11 News for the recent surge of city cleanup crews in storm-ravaged neighborhoods. "Amazing What Embarrassing TV Coverage Will Do" was the headline Tuesday on the popular blog Queens Crap, which spotlighted Greg Mocker's report on the rush of tree-removal crews to the Middle Village area, which was hit by a tornado on September 16. PIX 11 brought increased attention to the neighborhood with reports on the slow progress of the cleanup. While city officials denied PIX 11's coverage triggered the cleanup surge, people commenting on Queens Crap disagreed. "Bloomberg hates to have his 'Bloomberg' brand tarnished with negative comments particularly on TV," wrote one person. That was echoed by "Linda" who said: "Who cares what sign is on the truck, the damn trees are getting cleaned up!" Heh. I'm glad someone is paying attention. The rest of the news crews left a long time ago. Brooklyn got help from the U.S. Forest Service. 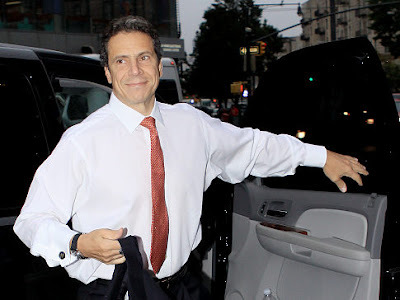 Cuomo offering deal to Hevesi? Disgraced ex-Controller Alan Hevesi is expected to plead guilty to a felony corruption charge for his role in a massive pay-to-play pension fund scandal. A source with knowledge of the case said Hevesi's plea could come in state Supreme Court as early as today. Negotiations were still underway last night. "They want to resolve the matter," the source said of the attorney general's office, which has been probing the scandal for more than three years. AG Andrew Cuomo's team said "there is no agreement between the attorney general's office and Alan Hevesi. The office has an ongoing investigation." It was unclear last night whether Cuomo will push for prison time. 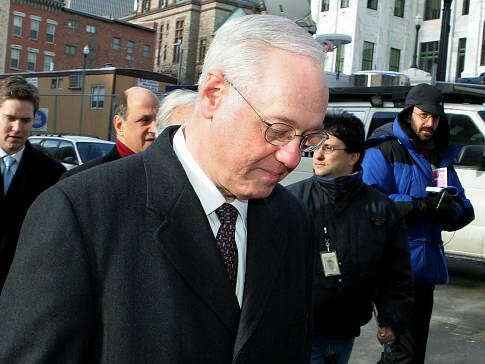 Hevesi resigned in 2006 after pleading guilty to a felony for using state workers to chauffeur his wife. Until recently, Cuomo's pension fund probe had only touched Hevesi on the periphery - though almost all of his top aides were indicted, pleaded guilty or cooperated with investigators. Investigators revealed in June court papers that Hevesi met regularly to discuss pension fund business with his political guru Hank Morris, who was slapped with a 123-count indictment for his role in the pay-to-play scheme. Morris was "intimately involved in the day-to-day business" of the pension fund, court papers allege. Firms wanting to do business with the fund were often forced to fork over campaign donations or kickbacks to Morris. Israeli investor Elliott Broidy, who has pleaded guilty as a result of the scandal, admitted providing luxury overseas trips to a top controller official and his family. Sources say that was Hevesi. Does "and his family" include Assembly Member Andrew Hevesi? Drug-sniffing dogs at Kennedy Airport hit a $1 million "smackpot," leading customs agents to more than 33 pounds of heroin, much of it sealed in bags of dried milk and coffee in luggage arriving from Guayaquil, Venezuela. Two Venezuelan men, flying separately from the same airport to JFK on Sept. 14 and Sept. 18, were busted when they retrieved their suitcases. Murilla Aquilera was arrested after his checked bag, which appeared unusually thick, was found to contain heroin, with a street value of more than $550,000, in milk-powder and coffee containers, authorities said. On Sept. 18, Holga Ortega-Bravo was arrested after a dog flagged a bag with five packs of heroin, worth $510,000, disguised as milk powder, authorities said. It almost goes without saying that in a functioning democracy, the voters choose their representatives. But some say it’s the other way around in New York where by drawing their own district lines, Albany lawmakers can pick and choose which voters they represent -- a longstanding phenomenon known as gerrymandering. 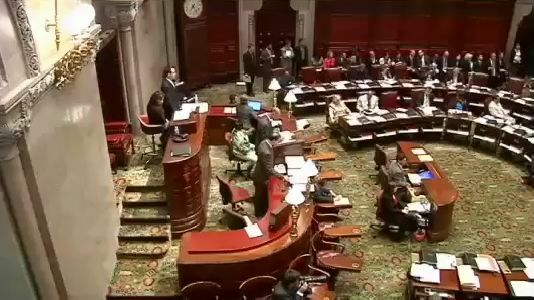 By law, the lines must be redrawn every 10 years, with New York divided up into districts for each of its 62 state senators; 150 State Assembly members; and 29 members of the House of Representatives. So who exactly gets to draw the lines? It’s a process essentially controlled by the leaders of each house in Albany -- the Assembly speaker and the leader of the State Senate. And historically, they’ve drawn the lines to make sure their members get reelected, and that their party remains in power. With the redistricting process set to begin early next year, there’s a major push to reform the process now, or else change will have to wait another 10 years. Pamela Blount can't hide her disgust. Last summer the city employee got a handful of parking tickets, each $115, all for parking in a bus stop. There's just one problem. "Not a bus stop," she said. "As of the 27th, this is no longer a bus stop." She's talking about the 27th of June. That's when the MTA discontinued the whole bus line on her street. This route was one of seven entirely discontinued in Brooklyn to help the MTA close an 800 million budget deficit. The routes were stopped, but the signs, all over Brooklyn, remain. The bus stop sign remains at 3rd and Dean, but on the same pole there is a sign saying the exact opposite - the bus stop is gone. Pamela even put a sign in her car window to let traffic officers know not to ticket, but she still got four or five tickets. That's interesting. 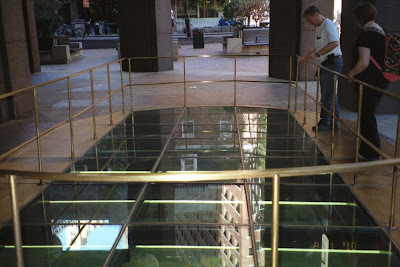 I thought it had to be in close proximity to Ground Zero and that it wasn't a mosque. So everything we've heard were lies? Fourteen people collected city pensions from beyond the grave - pulling in more than $450,000 even though they were dead, officials charged Monday. 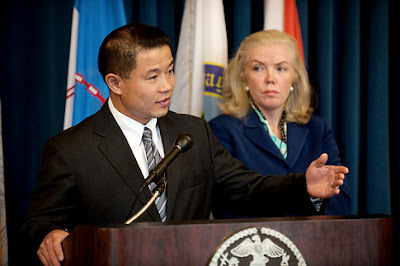 City Controller John Liu said relatives of the deceased apparently kept cashing their loved ones' checks - in some cases years after they had passed away. The ghoulish acts netted $459,970. Liu handed his report over to the city's Department of Investigation to determine if criminal charges will be filed. In the most shocking of the 14 cases, someone cashed 38 pension checks worth $139,818 after the intended recipient died in 2007. The scammer used the retiree's driver's license to bank the bogus pension payout. When the license expired this year, the scammer merely renewed it and continued "to cash the dead pensioner's checks," Liu said. The identities of the fraudsters and their dead relatives were not revealed because the criminal probe was just beginning, officials said. An additional 171 fishy cases, involving $2 million in taxpayer funds, are still undergoing scrutiny. In those cases, the checks continued to be cashed for shorter periods and could have just been due to mistakes or bureaucratic lags that failed to quickly shut off electronic transfers. 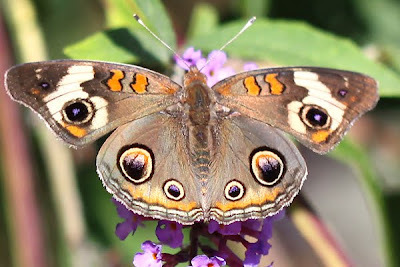 It's butterfly season at Fort Tilden. More at 10000 Birds. Earlier today, right around the time that the City Council was holding a hearing on the NYPD's controversial stop and frisk practices, cops slapped a Brooklyn man with a trespassing charge for standing under an awning to get out of the rain. 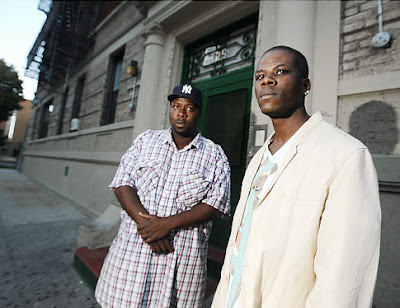 Vincent Mouzon, a 55-year-old telephone pollster who lives in Bedford-Stuyvesant, tells the Voice he was on his way back to a local laundromat after mailing three letters when he paused under an awning outside an abandoned building on Malcolm X Boulevard. When the rain abated, Mouzon resumed walking. About a block later, police officers from the 81st Precinct stopped and questioned him. The 81st Precinct, by the way, is the same station house that was the subject of the Village Voice's widely read NYPD Tapes series. "I showed them my identification and explained what I was doing," he says. "I even opened the laundry bag for them." Mouzon says he told the officers that the ticket would be thrown out of court. "I told them, 'look I know about you guys, I read the Village Voice article, and I know your precinct, and I know you guys are trying to make your quota,'" he says. "Here's a guy who was absolutely doing nothing, and now I have to go to criminal court and take a day off of work to deal with it," he says. "I was just standing there seeking refuge, and it boggles my mind that this could happen. This doesn't inspire trust in the Police Department. It's such a waste of time and taxpayer's money." 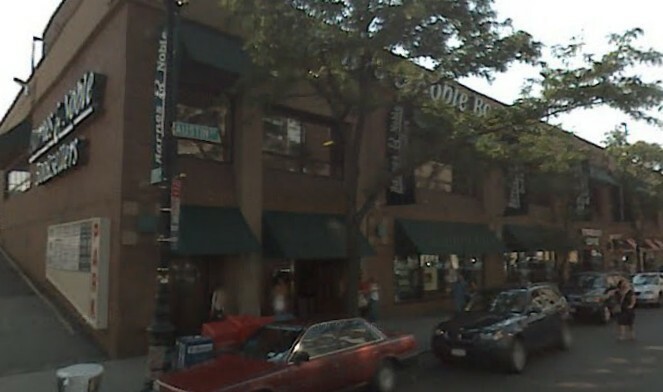 A man was found dead this afternoon in a second-floor bathroom at a Barnes & Noble bookstore, police said. Cops were called to the bookstore after getting a call at about 12:15 p.m. that a man was unresponsive in the bathroom at 70-00 Austin Blvd. [sic] in Forest Hills. When officers arrived they found the victim, identified only as a 25-year-old male, unresponsive. The store had only been open for two hours when the body was found. The Medical Examiner's office will conduct an autopsy to determine cause of death. The Second Avenue Subway may have avoided significant construction mishaps this year, but the troubled project is still far behind schedule and hundreds of millions of dollars over budget, lawmakers warned yesterday. 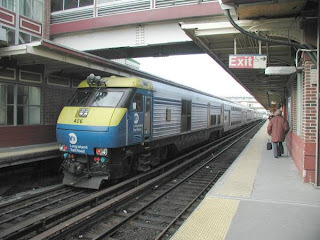 Rep. Carolyn Maloney (D-Manhattan) said the Federal Transit Administration estimates that the first phase of the "T" train running between East 96th and 63rd streets will cost $420 million more than the MTA's $4.5 billion price tag, and wrap up two years later than the agency's 2016 target date. A city attempt to "beautify" highway scenery by cracking down on billboards has backfired, making dozens of the massive signs enticing blank canvasses for grotesque graffiti. 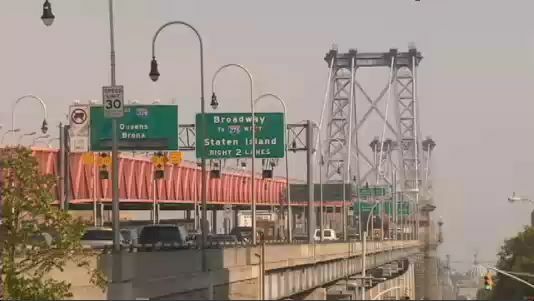 The results have left eyesores on the Brooklyn-Queens, the Long Island and Van Wyck expressways and 72 segments of other roadways and toll approaches in every borough. 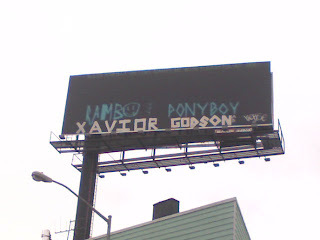 Many billboards now have incomprehensible scrawlings that read, "Xavior," "Ponyboy," and "Ramboy" -- especially along the BQE. The wretched art show began in February, when the city won a federal lawsuit filed by advertising companies that both allowed the Department of Buildings to register every billboards near "arterial highways" and also to enforce a rule that no commercial advertising can occur within 250 feet of the roadways. One small firm, Mogul Media said the city's crackdown has been so severe that most of its billboards are blank with many ravaged by graffiti. So now DOB needs to mandate that the billboards be removed. Problem solved. They even have to put their names on out-of-state contractors' trucks? No stranger to making education reforms, Mayor Bloomberg outlined a plan today to do away with lifetime positions and replace it with a system where teachers would be required to earn tenure. In an effort to focus on teacher quality and effectiveness, the city will implement a four-tier rating system for determining whether a teacher should be awarded the tenure protections that come with the job. Starting this year, only teachers rated “effective” or “highly effective” will be eligible for tenure, Bloomberg said, transforming a system from one in which tenure is taken for granted to one in which it must be earned. In the announcement, city officials said tenure may be awarded in the third year -- or any time thereafter -- always contingent on whether a teacher has made a significant impact on student achievement. Buildings Commissioner Robert LiMandri today issued 10 tips for renters on how to recognize the signs of an illegal apartment that could endanger the safety of its occupants, neighbors and first responders. These tips follow an undercover investigation by Department investigators who searched advertisements on Craigslist and posed as potential tenants to inspect 62 buildings throughout the City. Illegal conditions were found in 54 of the apartments for rent, including 33 properties where vacate orders were issued because the conditions posed an immediate threat to public safety. As a result, the Department issued 104 violations to property owners who created illegal conditions, including fire safety hazards such as inadequate means of egress and illegal gas, electrical and plumbing work. Monthly rents for these apartments ranged from $750 to $1,200. 1) Know the market. Be wary of units that advertise significantly lower price points for comparable apartments in the area. 2) Beware of the words “basement” or “attic.” Advertisements that use these words are often for apartments that typically lack adequate exits. 3) Avoid apartments that have rooms without windows or very small windows. These are often found in illegal cellar or basement apartments. Landlords will sometimes describe the ones with very small windows as “sunny” to entice renters. 4) Beware of the word “flex.” “Flex” implies that the apartment can be converted into a multi-bedroom unit using pressurized walls. The installation and/or construction of a wall without the proper permits from the Department are illegal. 5) “Utilities included” is a red flag. A landlord may not want utilities under another name connected to the property because those residents would violate the legal occupancy of the building. 6) Avoid apartments with odd layouts. They are often described as “unique” or “interesting” and are oddly situated (i.e. a shower installed in the kitchen). 7) Be cautious when a landlord refuses to disclose the exact address. Landlords advertising illegal apartments may ask to meet a potential renter before exposing the address to possible regulation or penalty. 8) Beware of apartments where you can’t have mail delivered. Landlords advertising illegal apartments will often request that tenants obtain a separate P.O. Box. 9) Beware of no-lease apartments. Be suspicious of a landlord who declines to draw up a lease, requests a month-to-month agreement or requires cash payments. 10) Check for adequate means of egress and look out for locked doors in the unit. A tenant should be able to access all available exits either directly from the unit or a public hallway. Following the investigation, the Department’s community liaisons have distributed thousands of educational flyers in the targeted neighborhoods to warn residents about the dangers of living in an illegally converted space. So far, more than 100,000 multi-lingual flyers have been distributed since the Department launched a citywide educational campaign in November 2009 when three people lost their lives in a fire in an illegal cellar apartment in Queens. Illegal conversions are building units that have been altered to create additional housing without obtaining proper approvals from the Department. For more information on the dangers of illegal conversions, or to verify permit and occupancy information for a unit, visit www.nyc.gov/buildings. About 1,000 more Queens households than usual still had no landline phone service 10 days after storms tore through the borough, officials said yesterday. 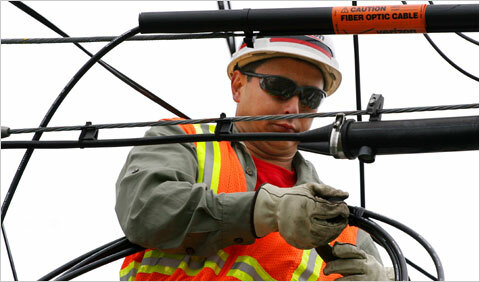 Verizon estimated that 2,000 Queens customers had no working landlines. That's about double its normal number of outages. The officials attributed the delay to downed trees and phone lines still hampering restoration. 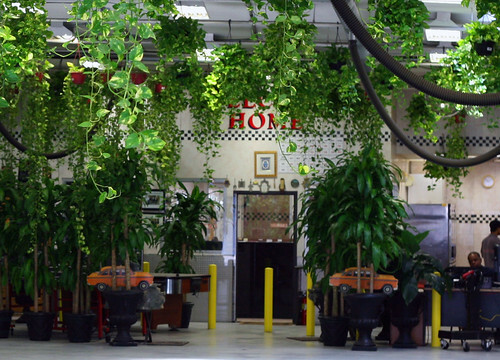 Welcome to the "Queens Cab Stand Jungle"
Courtesy of Scouting NY. Love it! With a flight attendant yelling "heads down, stay down," passengers cowered and prayed on a tense descent into John F. Kennedy International Airport as malfunctioning landing gear sent sparks flying and left one of the plane's wings dragging along the tarmac. No one was hurt Saturday evening when Delta Connection Flight 4951, operated by Atlantic Southeast Airlines, made its emergency landing on its way to White Plains, N.Y., from Atlanta, said Port Authority of New York and New Jersey spokesman Steve Coleman. It was a little tough to hear above all the noise about subway and bus fare hikes at the Metropolitan Transportation Authority's recent public hearings. However, drivers will also get caught in the agency's budget gap, when tolls go up next year. "We've had two in the past 18 months, and we really think it's unfair to motorists," said Robert Sinclair, a spokesman for AAA of New York. "The tolls that are collected are about 300 percent of what it takes to maintain the facilities." Given their deep financial hole, MTA officials say both transit fares and the tolls on its nine bridges and tunnels must go up, starting in January. At the major crossings, the proposed cash toll would increase from $5.50 a trip to $6. On smaller spans like the Marine Parkway and the Cross Bay, where the toll is now $2.75, the cash charge would go up to $3. The Henry Hudson Bridge will go from $3 to $3.50. E-ZPass drivers, who get about a dollar discount on all the crossings, would face a 10 percent hike per trip. AAA officials says drivers, socked with a new $50 vehicle registration fee as part of last year's MTA bailout, are a too-easy target. "We are actually subsidizing mass transit, which is not necessarily a bad thing, but we think there needs to be some equity," says Sinclair. Subsidized or not, transit advocates saying straphangers should not be asked to pay more and get less service. They have renewed their call to introduce tolls on the city's East River bridges. They also want to revive Mayor Michael Bloomberg's congestion pricing plan, which would charge drivers to enter much of Manhattan, probably below 96th Street, at the busiest times of the day. AAA opposes both moves, which are out of the MTA's hands and up to the state Legislature. This is a real-estate story that bears not a lick of sanity. Because after midnight Sept. 30, city honchos -- made to look foolish by a renegade posse of mainly elderly homesteaders laying claim to a bucolic stretch of beach --are fighting back. They're destroying Cedar Grove Beach Club, an immaculate summer village plunked in the distant borough a century ago. Once, little Cedar Groves dotted the city from Brooklyn to The Bronx, offering respite to overheated city dwellers. Now, it's the last of its kind. But, given the chance by the state to landmark the historic site, which costs taxpayers nothing to run, officials chose to bulldoze it. Now residents fear, with good reason, that their beloved beach will wind up an abandoned, city-controlled condom and needle depository, like so many others. A century ago, land on Staten Island was cheap and no one cared about the boroughs. Cedar Grove began with tents. Cottages followed. By the 1940s, more than 200 houses dotted the 307-acre parcel, plus a community center and even a summer camp. Six generations played here from June to October, trudging back to other parts of the city come winter. But in 1962, the houses were seized via eminent domain for a Robert Moses-planned highway. When the road never materialized, Islanders were offered a deal: Rent the property from the city, or get lost. This arrangement worked well for 48 years. The city has put aside $1.9 million to fix up Cedar Grove -- money, ironically, from the rent paid by Grovians. It's not enough, officials admit, to get through even one summer. Face it. Government just can't run things more efficiently than private citizens. In 2002, Mayor Bloomberg sold 11 East Village townhouses -- worth millions -- for $1 apiece to squatters living in them illegally. I propose the city make the same offer at Cedar Grove. Better yet, build a mosque on the property. That will make it untouchable. Parks announces that it will be opposing all efforts (namely, that of local public officials, historians, and the members of the beach club) to give the beach club a designation on the national registry. How are they going to pay for all this loveliness? As we reported, the Parks Department says it is going to use $1.8 million collected from fees from the residents. Phase III, which appears to include the greenway construction as well as "picnic grounds" and "pedestrian pathways," Parks admits, is still "unfunded." 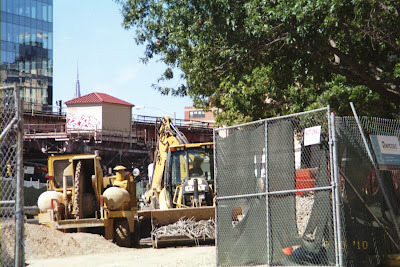 There is no funding in place for the remaining work, a cause for concern among elected officials who for weeks have been pressing Parks on its ability to finance such a project while other beaches and parks languish across the borough and as the city continues to tighten its belt. Parks' budget was slashed by 11 percent this year -- and Mayor Michael Bloomberg this week ordered his commissioners to trim $800 million from the current $63 billion city budget and an additional $1.2 billion next year to avoid layoffs. "It's a typical rope-a-dope by the Parks Department," said Councilman Vincent Ignizio (R-South Shore), whose district houses Cedar Grove. "They're going to get in there with their $1.8 million, knock the bungalows down and then walk away and we will never see the real plan implemented." Yup. You can count on that. It's also interesting that Parks has been telling other communities they have to have all the funding in place for a new park project before they can proceed, yet here they are making an exception. A wild brawl at a Woodside bodega saw combatants pelt each other with beer bottles, produce and floral bouquets, cops said. 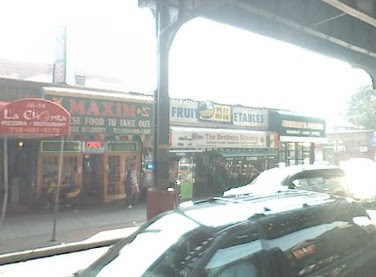 Marcos Juela and Segundo Lopez, both 29, along with friends Cesar Juela, 21, and Oscar Montalbo, 29, allegedly threw the wares at a man after getting into a midnight argument Sunday outside Brothers Grocery on Roosevelt Avenue. The elder Juela and Lopez lobbed beer bottles that shattered and cut a victim's face and body, police said. 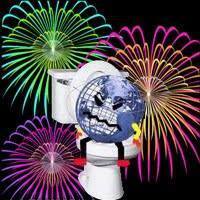 Then the quartet allegedly fired off various fresh fruits, vegetables and flowers at the man. Cc: "loren@carolynmaloney.com" ; "Peyre, Brice" ; "Babor, Edward"
I am told an MOU is being executed with Queens Library shortly, and that the millstones will be moved to the library in the next month or so. The millstones will be on display at the library where they will be seen by tens of thousands of visitors. I’m told the cost of moving them is de minimis – the city has the manpower, the fork lift and the truck to transport them, so the extra cost is gas. The Queens library is assuming any costs associated with displaying the millstones in a safe and appropriate way. We are aware that there was some support for moving them to the Greater Astoria Historical Society, and while it is a fine organization with strong community support, there was more support for moving it to the library which has many more visitors. 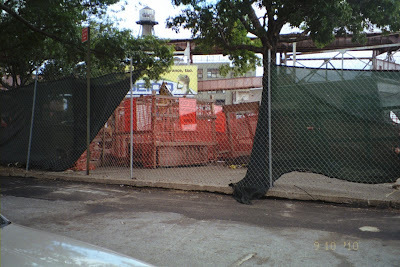 I know the issue of the millstones was considered by Community Board 2, where the Queens Plaza project is being built, and that their input was considered. (and I am aware that Dutch Kills is not in Community Board 2, although the Queens Plaza project is). We look forward to the next stage, when the millstones will be returned to the community where they can be admired by passersby in the neighborhood in which the mills originally operated. It was reiterated to me by representatives of both EDC and City Planning that a new plan will be made for displaying the millstones without drilling them. I hope this is responsive to your concerns. 1) Whoa, I thought the city's position was that the stones were "too fragile" to be moved? What happened to that? 2) Have you heard anyone say they wanted them in a library located between 2 sets of housing projects? All I remember is one side saying they shouldn't be moved from Dutch Kills/Queens Plaza, and the other side saying they should be put in a museum/historical society. Where the hell did this plan come from? 3) What is really going on here? Why did it take so long to get a response to the e-mail below? Why were there no follow up meetings, as promised, after the one held in June? Our Dutch Kills Community is hearing rumors that the Millstones will be re-located to the library. Why was our community not involved in this decision?? Why a secret?? This is outrageous.. This is disrespect to all of us in our Dutch Kills Community. We need to know who made this decision without consulting us. There are a lot of folks who should be ashamed of themselves -- including Terri Osborne, "Director of Queens Tourism". Ha. Good one. Sounds like honest graft to me! Here are the numbers The Post’s experts — the ex-city official, watchdog Henry Stern and developer Ken Diamondstone — found suspicious. Instead of simply renovating its own buildings, Ridgewood Bushwick sold them for $14.9 million to itself and another investor for an “inflated” amount in what may have been a bid to get more government financing, said a former city official. The sale doubles the total cost of the project, he noted, so the developer fee — based on a percentage of the total project cost — is doubled as well. This $5.6 million fee is quadruple what it should be, the former official said. The state claims it’s simply a clerical mistake that includes all preconstruction, or “soft,” costs in addition to the actual payment to an architect and engineer. Still, the ex-official asserts, the sum is troublesome. “If I had a project where my soft costs were greater than my hard costs, the only reason why would be to stick a bunch of money in my pocket,” he said. This reporter is somewhat annoying, but effective. Two Queens city councilmen took to the streets Tuesday morning to get support from parents over a bill that would mandate small businesses to give their employees paid sick leave. 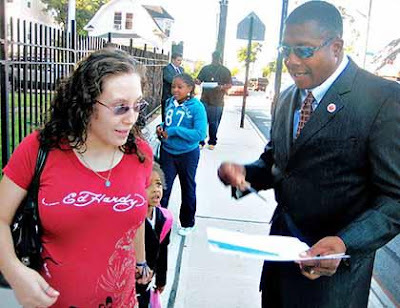 Councilmen James Sanders (D-Laurelton) and Danny Dromm (D-Jackson Heights) joined members of the Paid Sick Leave Coalition outside schools in the borough to push for the passing of Intro 97-2010. The bill would mandate that businesses with 19 or fewer employees offer at least five paid sick days, while bigger companies would have to give a minimum of nine days. 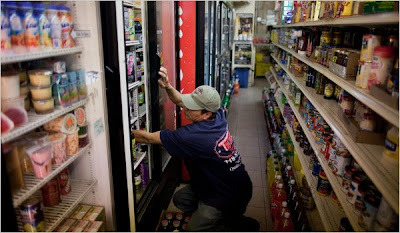 Sanders, who spoke with parents outside PS 132 on 218th Street in Springfield Gardens, said the bill would be beneficial for New Yorkers not only economically but also in terms of health. There is no federal or state law that requires companies to provide their employees with paid sick leave, but Washington, D.C., and San Francisco have laws that provide for this work amenity. An October 2009 study by the Institute for Women’s Policy Research found that 1.2 million New Yorkers, roughly 42 percent of the population, do not get paid sick leave. The bill is currently slated for a vote in the Council after Council Speaker Christine Quinn (D-Manhattan) tabled it in the summer. Dromm also promoted the bill at an event outside PS 69 on 37th Avenue in Corona. Oh how nice. You guys think that the average baker or florist has 5 extra days pay laying around for each employee? We will be seeing more unemployment if this bill passes. The good news is it will sink Christine Quinn's mayoral campaign if she doesn't get indicted first. 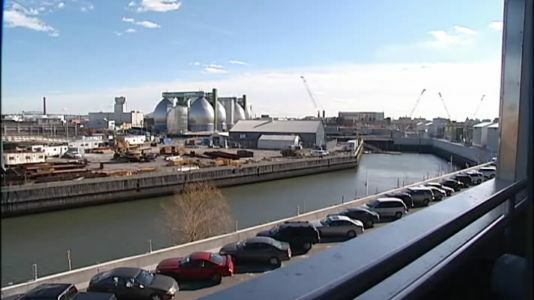 The Environmental Protection Agency is preparing to make a major announcement about Newtown Creek. Sources tell NY1 that the EPA plans to designate it a superfund site during a conference call on Monday. 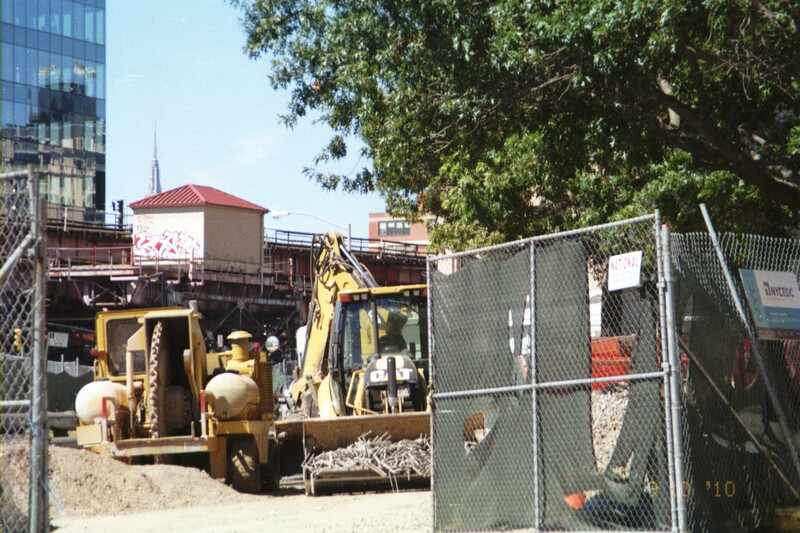 In 2008, the EPA agreed to test the amount of toxic chemicals and hazardous waste in the creek, to determine whether it should be a superfund site. The designation would make it eligible for federal funding to cover most of the costs. The creek, which borders Brooklyn and Queens, was the site of a massive underground oil spill believed to have started in the 1950s that went unnoticed until 1978. A Brooklyn man standing in front of his apartment was hit with a trespassing ticket, even after cops watched him use his key to get inside. Lindsey Riddick, still fuming over the bizarre Aug. 18 incident, said he showed police his identification. And when he opened the door to the Flatbush home, his girlfriend and two daughters greeted him and then ran outside the apartment. "I told the officer, 'I live here and I have the key,'" recalled Riddick, 36, whose brother, Michael Riddick, also got a summons for trespassing. "You're giving me a summons? Come on, man. You got to be kidding me." The brothers' claims have been added to a class action federal suit initially filed in May that accuses city cops of doling out illegal summonses to meet quotas. The class action suit has 22 plaintiffs alleging bogus summonses across the city. In 19 of the cases, the summonses were dismissed. The cases against the Riddick brothers are pending. The disposition in one case wasn't clear late yesterday. Queens Theatre in the Park (QTP), an iconic structure from the 1964 World's Fair, celebrated the completion of a $27 million renovation and expansion with a ribbon cutting ceremony and reception on Thursday, September 23, 2010, attended by dozens of the borough's elected officials and invited guests. QTP recently completed a $27 million physical transformation of the Theatre with funding provided by Queens Borough President Helen Marshall, Mayor Michael R. Bloomberg, New York City Council Speaker Christine Quinn and The Council of the City of New York. This major capitalinvestment has added a 75-seat cabaret performance space with a full service cafe and kitchen facility; created a dramatic new 3,000 square foot lobby/reception area; provided new visitor amenities and improved the facility's accessibility. "The Queens Theatre in the Park is one of the pearls in the unique necklace of performing arts centers and cultural institutions found here in Queens. The Theatre also has a unique challenge - to satisfy the entertainment needs of the most diverse audience in America. That's why as your Borough President, I was proud to allocate approximately half the funding needed for this renovation and expansion. It would not have happened, however, without the support of Mayor Bloomberg, our City Council and the generous support of private individuals and partners, like the Bank of America and many more. Their generosity and support have helped to make this former World's Fair site, which provides world-class entertainment, ready for the world of tomorrow's theatergoers," said Queens Borough President Helen Marshall. "On behalf of the Members of the City Council, I am pleased to note our active participation in securing much needed funding to improve and beautify Queens Theatre in the Park. The Theatre is one of our City's premiere showplaces for arts and culture. Knowing that over 100,000 adults and children visit the Theatre each year, the Council responded to the Theatre's urgent request to improve public amenities at its venue. The new lobby and reception area are a beautiful gateway to the performances taking place inside the Theatre's three performance spaces. The new cabaret will serve as a catalyst for the Theatre to engage more contemporary and emerging artists and provide these artists with an important showcase for their work," said NYC Council Speaker Christine C. Quinn. Think of how many other landmarked theaters could have been saved with this money and converted into performance spaces. Instead we pour money into something that's not even all that accessible by public transportation. There's also a decent chance that pieces of the NYS Pavilion will fall onto it and damage it. Amazing. The City Council launched a new program Thursday to give tenants in certain dilapidated properties a new weapon in their battle to improve building conditions. The initiative will focus on properties where excessive debt burdens taken on by the owners have severely limited their financial ability to make necessary repairs. Engineers and architects, working on a pro-bono basis, will survey such buildings across the five boroughs and produce detailed reports on how extensive the damage is, what repairs are needed and how much those repairs will cost. "This new program will help level the playing field,” said Maggie Russell-Ciardi, executive director of the advocacy group Tenants and Neighbors. “It will arm tenants with the information they need to determine what a truly supportable mortgage or sale price for their buildings would be. And it will help tenants refute false claims by owners and lenders that everything is fine in buildings that are heading rapidly towards financial failure." The citywide program is an expansion of a pilot in which New York City-based Baer Architecture Group produced a detailed report on 10 foreclosed-upon Bronx buildings that argues the properties need up to $26.6 million in repairs, more than five times an earlier estimate by the properties' current overseer. The $35 million loan on the buildings—part of a portfolio bought by Los Angeles-based Milbank Real Estate at the height of the housing boom in 2007—is expected to be transferred to a new, undisclosed buyer next week. Concern is high among elected officials, tenants and housing activists who worry that the properties—which are saddled with 3,261 code violations—will likely deteriorate further because the new owner is paying too much for the portfolio and won't be able to make needed repairs. 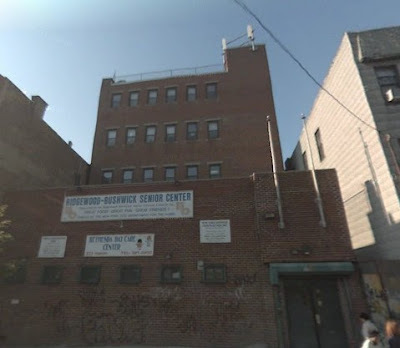 Tenants report to us that the Queensbridge Jacob Riis Senior Center kitchen and all its food service has been closed down by the NYC Department of Health!! The Queensbridge Jacob Riis Senior Center is funded by the DFTA, NYC Department for the Aging Jacob Riis Center Chief Executive Officer is William T Newlin. He gets paid $137,500. NYC Council Member Van Bramer had recently announced that he had secured "$205,250 for ... Jacob Riis, increasing the free senior meal program." So what will happen to the food money? The city said Thursday it won't charge tornado-battered New Yorkers to replace the ruined sidewalks outside their homes and businesses. Just don't ask when the repairs are going to get done. "We're just asking patience," Parks Commissioner Adrian Benepe said in Forest Hills, Queens. "The thing we need to do is address the hazards first." Hundreds of workers across Brooklyn, Queens and Staten Island are still clearing trees and other wreckage left after two tornados and one nasty "macroburst" blew through the city last week. "Right now, we have hundreds of unsafe trees everywhere," said Robert Holden of the Juniper Park Civic Association in Middle Village, a Queens neighborhood hit hard by the storms. "We have dangling branches and giant branches sitting on other branches. It's an accident waiting to happen," Holden said. 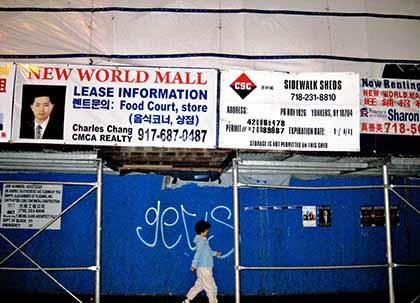 The former site of the Caldor department store in downtown Flushing is slated to open by the end of the year as a mall with a wide range of new amenities for area shoppers. But the supermarket might be a point of contention with the area’s non-Asian residents, many of whom have been vocally opposed to the conversion of two Key Food store locations into Asian groceries in the past year. Community Board 7 District Manager Marilyn Bitterman said she believes the supermarket will primarily serve American foods, but will offer an Asian food section. But on Tuesday, Shi said the store will be a primarily Asian one. The Rosedale community has won the fight to keep the neighborhood from losing its small, residential character after the City Council voted to rezone the neighborhood last Thursday afternoon. In a unanimous vote, the full Council decided to change the designations of 260 blocks in the southeast Queens neighborhood after years of urging from residents. 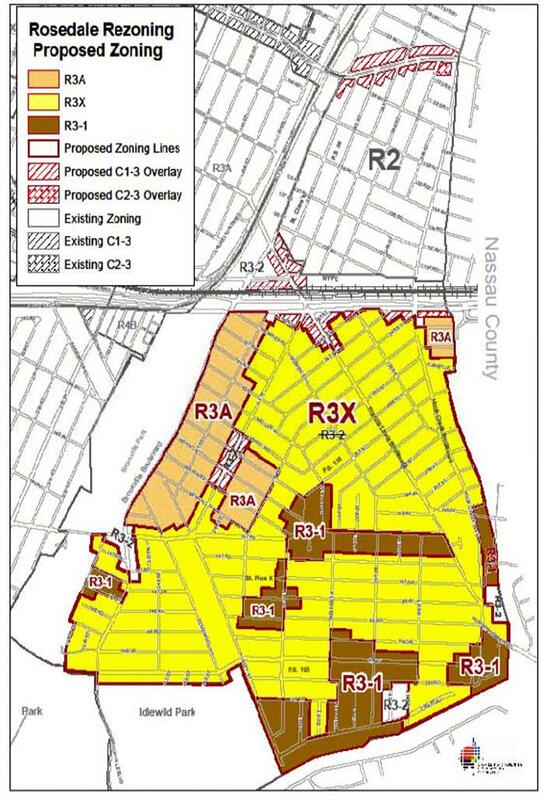 Councilman James Sanders (D-Laurelton) said that for too long developers would take advantage of the zoning, which was more than 40 years old, and build large, multifamily dwellings in the neighborhood that has been predominantly populated with single- and two-family houses. The plan covers the area bounded to the west by 235th Street, Brookville Boulevard and the Cross Island Expressway; to the south by 149th Avenue, Huxley Street and Craft Avenue; to the east by Hook Creek Boulevard; and to the north by the Belt Parkway. Homes south of the parkway were zoned R3-2 and allowed for construction of multiple family homes to be built on properties. 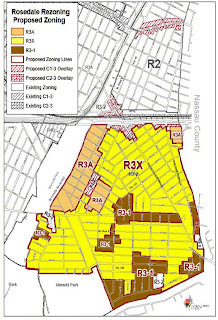 Now those zones will be designated R3A, R3-1 and R3X, which only allow for one- and two-family homes. “We will not allow sleazy developers to ravage our communities by taking down stately mansions and putting up cheese-box houses unfit for the designation of a home. We are seeking rules and regulations that say if you take down a one-family home, you can only put up a one-family home,” the councilman said. They'll figure a way around that. And sadly, you'll probably help them. Although I do like the term "cheese-box house". The $800 million Flushing Commons development project has cleared its final bureaucratic hurdle after nearly a decade of planning. The Queens Borough Board voted Monday evening to approve the city’s plans to sell the downtown Flushing land where the project is slated to be built to its developer, TDC Development. The vote was unanimous but came with a healthy does of chastising by City Council members and Eugene Kelty, chairman of Community Board 7, which did extensive work to address community concerns regarding the project. “The Community Board has tried to work hard to make sure the project was modified as best it could be ... The EDC needs to follow through with the letters, the community needs to be satisfied and the EDC needs to continue to work with [Councilman] Peter Koo [R-Flushing],” Council Land Use Committee Chairman Leroy Comrie (D-St. Albans) said. 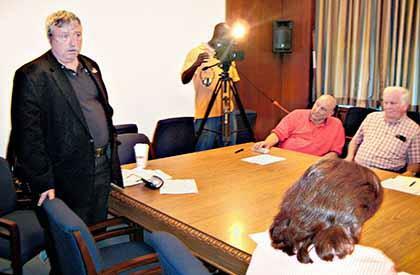 Kelty said at CB 7’s Sept. 13 meeting that he would only vote to support the project Monday if the city, the developer and other groups drafted letters indicating that they would address remaining concerns CB 7 had about the proposal. In the end, Kelty said he nearly voted no for the project because of these issues but that he and his other executive board members decided that it was best to vote in favor since most concerns had been addressed. As we expected, the barking being done by CB 7's Gene Kelty about Flushing Commons turned out to be meaningless-and frankly we weren't surprised that the former fire marshal resorted to self-immolation, since he has been huffing and puffing to no avail for years; while at the same time fronting for the kind of development that will severely hurt the community he allegedly represents. 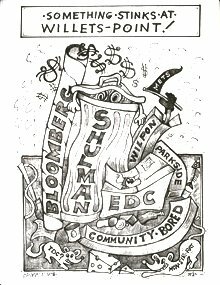 EDC must be laughing their collective asses off-and their contrition is risible: "Carolee Fink, the EDC’s project manager for Flushing Commons, apologized to Kelty after the meeting and told him the agency would move to quickly fulfill his request." These are the kinds of promissory notes that are best suited for being utilized to replace a used roll of Charmin. Is Bloomberg really ok with this? Night and day, the heavy front door rarely stops swinging. Men and women pass one another at the entrance of a four-story building on 21st Avenue in Bensonhurst, Brooklyn, on their way out to work, or back in for a few hours of sleep between shifts. They are line cooks, construction laborers, deliverymen, deli workers, housecleaners and gardeners. A dozen of the building’s 16 apartments are occupied by Mexicans, and most of those have two families per unit, sometimes more. Except for a few women caring for small children, all the adults — about 50 — are employed. Most work long hours, six days a week, for minimum wage or less. Some have two jobs. The building is a microcosm of Mexican industriousness in New York City. 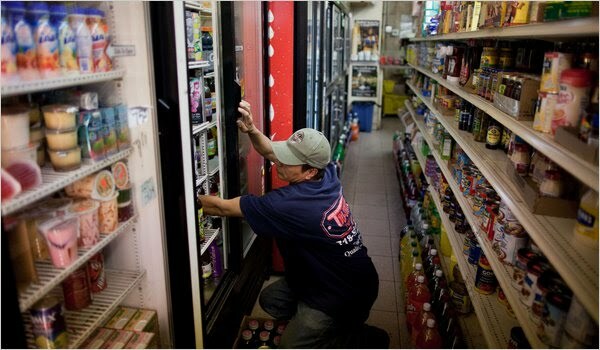 And there are hundreds of others like it, bastions of low-wage work, crowding and hope. That success, though, has a flip side. One reason Mexicans have found work in such numbers, experts say, is that many are illegal immigrants, and less likely to report workplace abuses to the authorities for fear of deportation. Several tenants in the Bensonhurst building said they had held jobs that paid less than the minimum wage. The tenants, who asked that their last names be withheld because they feared being fired or deported, said they had never been paid overtime compensation, were routinely handed the least desirable tasks and were sometimes forced to work on their one free day. We must look the other way when we discover people living in overcrowded, unsafe conditions who are being abused at work because to do something about this would be anti-immigrant and racist. This is the Bizarro World we live in. And Lord knows, Americans and legal immigrants don't want to be line cooks, construction laborers, deliverymen, deli workers, house cleaners or gardeners, especially in this economy and with unemployment at 10% in some places. It's funny, but after Fresh Direct was raided and forced to hire people who were here legally, they didn't collapse. After touring Astoria’s historic Steinway Mansion on Friday, Councilman Peter Vallone Jr. (D-Astoria) was inspired to write letters to city officials and preservationists asking that they purchase the building for use as a museum, park or community facility. In an attempt to secure the building for the city, Vallone has written to Mayor Mike Bloomberg, the Department of Parks and Recreation, the Trust for Public Land and the Historic House Trust of New York City for assistance. The building slated to become a mosque and community center near Ground Zero now hosts weekly prayer services for several hundred worshippers despite two open violations for "immediately hazardous" conditions, The Post has learned. The safety violations -- for holes in floors and the lack of an automatic sprinkler system -- were issued by city inspectors Aug. 3 and Sept. 1, but that hasn't stopped owners of the 152-year-old building from getting temporary permits from the city to use it. "The two violations will not impact the current temporary place-of-assembly permit, which allows the space to be occupied," said Buildings Department spokesman Tony Sclafani. Ground Zero mosque imam Feisal Abdul Rauf must reimburse Union City, N.J. officials for costs associated with keeping an off-duty police officer on guard at one of his dilapidated apartment buildings, The Jersey Journal reported Friday. Rauf was ordered to pay $12,960 to city authorities who were fired up after having to front the ten days¿ worth of pay earned by the officer keeping fire watch while the imam made repairs ranging from faulty fire alarms to moldy bathrooms and bedbugs. Over 200 health and fire code violations were found in the building, and Rauf has until Oct. 9 to fix them. Union City is suing the religious leader for ignoring some 30 tenant complaints from 1996 to 2010. We are forwarding you a picture of an occurrence that happens every day, several times a day. Beginning at 6AM Tractor trailers and other Commercial Vehicles utilize 5th avenue in Whitestone Queens as a conduit to the entire surrounding area. 5th avenue is a 27 foot wide street minus 7 - 8 feet for parked cars on each side, it is a RESIDENTIAL STREET WITH 28 HOMES ON IT MANY OF THEM NEWLY RENOVATED. A STREET WITH OVER 20 CHILDREN UNDER THE AGE OF 15 LIVING ON IT. 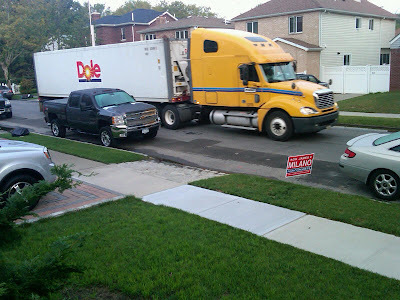 These Commercial Vehicles speed on our street, shake our foundations, set off car alarms and create a Dangerous situation for all families living on the Block. Yet, according to Maura McCarthy of Queens DOT, and Gene Kelty, Chair of Community Board 7, and President of Whitestone Boosters Beach, it is not a danger, just a mere inconvenience. This on top of the 107 cars per hour which travel eastbound (33% speeding), is not enough to get the 3rd avenue exit on the Bridge pushed back to its original design of 7th avenue, not enough to make 5th and 4th avenues a ONE WAY WEST BOUND TOWARD THE BRIDGE, not enough to extend the already once extended concrete divider forcing cars to go down to 3rd avenue ( a 57foot wide street with 7 houses on the block and a park on the other side) which would then allow for enforcement of commercial vehicles who get off the wrong exit, not enough to do anything that will prevent damage and possibly tragedy. Two avid cyclists are hoping to show the perils and possibilities of biking in Queens with an intense race around the borough. 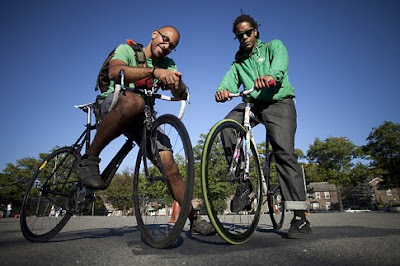 Professional bicycle messengers Rafael Negron and Tony Monroe are organizing a race on tomorrow along Queens' busiest roads to highlight what they believe is an often overlooked and dangerous borough for cyclists. These no-holds-barred "alley cat" races pit riders of all skill levels against each other, passing checkpoints to see who is the quickest of the pack. The contest, dubbed "BLVDS of DEATH," was inspired by the horrific stories of pedestrians and cyclists killed along Queens Blvd. Along with bragging rights, the winner will receive a messenger bag and other bike-oriented prizes, such as wheels. Why did Stop and Shop close? What is the Council hiding? Are we in for a big boom? Census truth: They just make it up! Can we have a mental competency exam, please? Time to limit legal gun ownership!